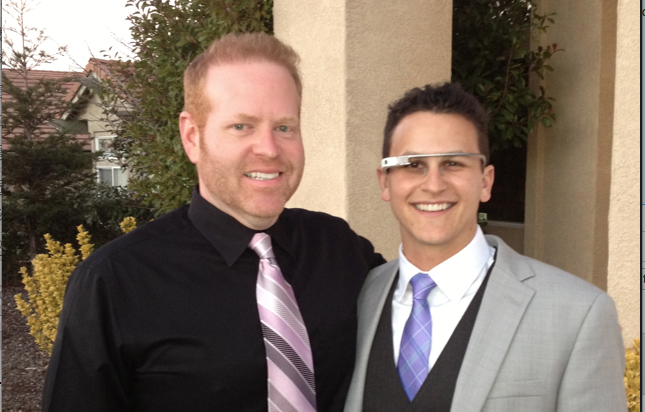 An employee from the Googleplex made a visit here last weekend and showed off Google Glass in San Luis Obispo. It’s is an augmented reality head-mounted display that looks like a pair of glasses. It presents information in smartphone-like format. It’s hands-free and can interact with the Internet via natural language voice commands. It’s shaped like a pair of glasses without lenses. It fastens to the front of your forehead with over the ear side bars and two traditional nose pieces, just like a pair of spectacles. It looks a little geeky, but not as much as I expected it to. I think it will be the ‘new normal’ in a couple of years. Out in front of your right eye is a small glass block with a prism inside that projects a television screen image. The right hand-side of the device is wider and thicker than the left. It holds the battery and various controls. The device is thin, light and feels a bit fragile. The screen appears smaller than I expected it to. It looks a bit like a 42″ big screen TV mounted on a wall 12 feet in front of you to the upper right. The resolution is relatively low. The visual interface is more like an iPod Nano than a smart phone. But still, it’s an amazing technology. When I tested Glass and watched it in use, I noted that it allows the user to scroll through contacts, photos, video, map directions, text messages and emails. It has turn-by-turn navigation. With verbal commands the user can respond to messages and interact with all the features including making phone calls like a regular Bluetooth earpiece. In addition to the voice commands, Google Glass has a touch sensitive right-hand side bar. You tap once to wake it up. Swipe forward or backward and you will scroll through selections of the current application. Swipe up and down to scroll between apps. The front right of the device has a camera for photos and video. It can easily capture pictures and video with verbal commands like “glass take photo.” Warning: Google Glass does not have an indicator light letting people know they are being videoed or photographed. So you may be recorded without knowing it. 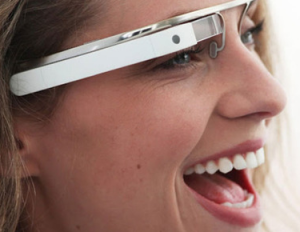 Via a Bluetooth connection to your smart phone, Google Glass is connected to the internet. As you take photos and video, it automatically uploads them to your personal cloud storage and Picasa accounts. Is Google Glass important for Local SEO? You bet. When you start seeing Google Glass in San Luis Obispo, you know people will be using it to ask questions like, “Where is a good place to eat around here?,” or “Help me glass, I need to get an oil change.” It will be a lot like the iPhone’s Siri. If you are in business, get ready for implications of this Internet search capability. Start working on your local search engine optimization. Prototypes of the device will be shipping soon with a software developers kit (SDK) to companies interested in creating Google Glass Apps. This will dramatically expand the features available. Glass does not currently track a user’s retina, but that could be a future development that would let the user mouse over the screen by pointing his or her eye. Word is that a retail version may be release later this year. I hope so. Posted by Scott Brennan Access Publishing 806 9th Street #2D Paso Robles, CA 93446 scott@accesspublishing.com (805) 226-9890 Join me on Google+. Related Articles: Presentation on Local SEO in SLO County Yelp Matters To Your Business Is Bing Important to My Business?